The novel ornamental sunflowers offered by SeedSense Ltd are the result of over fifty generations of research and breeding started in 1976 by Dr. Thomas Heaton. That long term effort has produced an array of plant types and petal colours never before seen in sunflower, annually encompassing more than four hectares of research plots. Every year researchers relentlessly search the world for new traits in both wild and cultivated forms of sunflower. The release of each new ornamental sunflower creation by SeedSense Ltd can take as much as five years as it is crossed, combined, selected and tested. During that process we collaborate with our colleagues at private and public institutions to discover new applications in horticulture for our sunflowers. We seek to not only invent new sunflowers, but also to create new marketing opportunities for the entire industry. 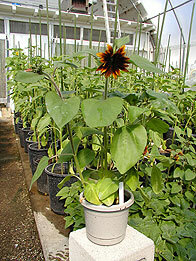 SeedSense Ltd is proud to exclusively offer original and pollenless sunflowers. Strict standards are employed to maintain quality throughout seed stock and commercial production. In an effort to protect the essential genetic integrity of their proprietary sunflower varieties for customers, researchers for SeedSense Ltd have allied themselves with BioDiagnostics Inc of River Falls, Wisconsin, USA, in the development of a DNA registration programme to preserve and document the varietal breeding advances in sunflower. Customers of SeedSense Ltd can rest assured that its sunflowers are truly unique in origin and performance.